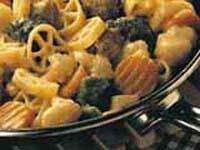 Quick and hearty mix of sausage and pasta with vegetables and cheese. Cook pasta to desired doneness as directed on package. Drain; cover to keep warm. Meanwhile, cook vegetables in sauce as directed on package. Brown sausage in large skillet over medium heat until thoroughly cooked; drain. Add pasta and cooked vegetables to skillet; toss gently.